Midnight snacks. You know what they say, "If you weren't supposed to eat them, why is there a light in the refrigerator"? My sentiments exactly. The other night on FB, I mentioned I was SO hungry. I asked what everyone else was eating and reader, Evelyn Brock Horsley told me she was having "HoneyBun Cake". HALLO!?! I needed the recipe and she kindly posted it. 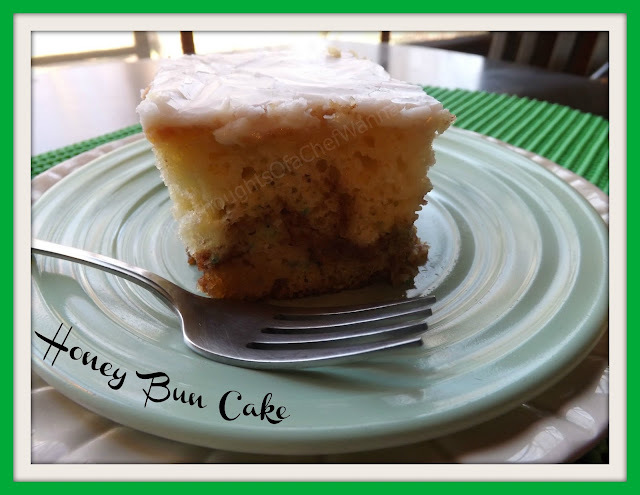 Fast forward to Tuesday afternoon, I wanted a dessert for after dinner so I check out this recipe again. I didn't have all of the ingredients so I improvised. As my husband always tells me when things aren't as I think they should be "improvise, adapt, overcome". He makes me nuts sometimes! HA! I am in with both feet and my HEAD if it involves cinnamon. Throw in brown sugar and icing....pffttt. I am a goner! Anyway, this started as a complete fail, and then somehow I pulled it out. I know, I only pulled it out because I have boxes of cake mix, I hoard them. A fancy cake or occasion I make from scratch but 2 hours before dinner, it is a box mix. Touchy subject for some, and it is ridiculous and hilarious to me how people get! So, this cake will surely feed a crowd, after all, you are getting 2 cakes in the same pan! When you add the ingredients required in the original recipe, it gives you enough batter to just use one cake. Since I biffed on that one, I ran downstairs and grabbed another cake mix from the pantry and just went with it. What I came out with was a HUGELY tall, delicious cake, that I will be making regularly! Prepare cake mixes according to package directions. Preheat your oven to the temperature they call for, likely 350 degrees. Set aside. In a separate bowl combine, brown sugar, and cinnamon. Mix until it is completely mixed. In a greased or sprayed 9x13 pan add in half of the cake batter. Now sprinkle the entire brown sugar mixture over the batter. Next, add the other half of the batter on top. Take a butter knife and lightly swirl it around in the batter just to swirl the filling and make it a little prettier when cut. Bake for 55 minutes. Start checking with a toothpick or skewer at 45 minutes. When it comes out clean it is done. While the cake is baking, combine powdered sugar, milk and sugar. Whisk until completely smooth. When the cake comes out, let it sit 5 minutes ONLY and then pour the icing over the entire top of the cake. Let cool completely before serving. This cake was better the second day, than the first day. I mean, not like I would know, I...I...um...I just was TOLD. Yea, ok, so I do know, because I ate 2 pieces! Enjoy my near miss, that turned out awesome!! Oh. My. Gosh. What a happy accident! :) This looks delicious, and I have no issues with cake mixes! ;) Thank you so much for a great recipe!! 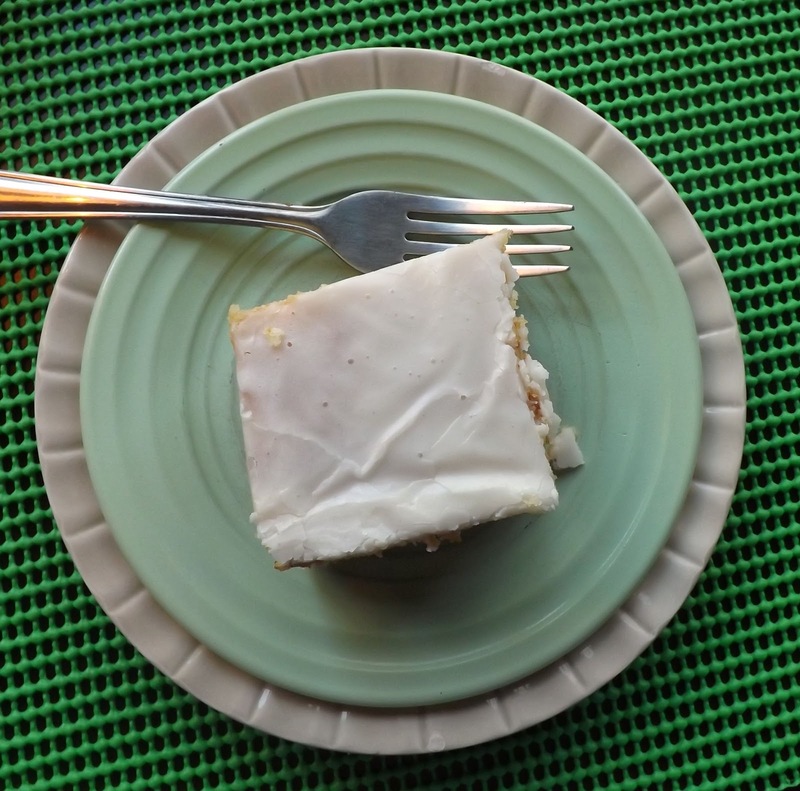 please also share the recipe for the HONEY BUN CAKE your reader, Evelyn Brock Horsley sent you!! !